I love ice cream. I loved it before I went vegan, and I love it now that I am vegan. 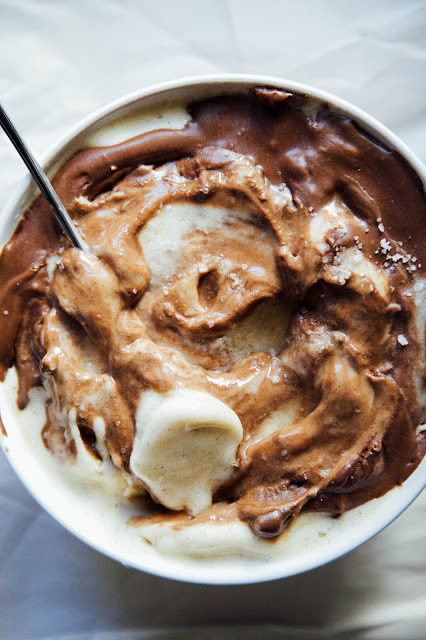 You might be asking: wait, how can vegan ice cream be a thing? Isn’t that an oxymoron? Nope, let me tell ya. To make the nice cream: blend all ingredients together until smooth, adding some coconut cream or vegan milk if your blender needs help. Scoop into one or two bowls and leave in the freezer while you make the chocolate sauce. To make the chocolate sauce: blend all the ingredients together until smooth. Pour over your nice cream and enjoy immediately! I like mine with a sprinkle of fleur de sel on top.